As you may or may not know, Doctor Bitz and I are two of the co-hosts of "A Very Special Episode", a podcast which reviews "very special" episodes of pop culture - those stories where the usual rhythm or tone of an ongoing narrative is briefly interrupted to discuss a serious, topical or otherwise atonal issue, usually with little advance warning or subsequent follow-up. Most often, we review TV episodes, like the infamous child molester episode of Diff'rent Strokes or the episode of Family Ties where Alex Keaton grapples with the death of his previously-unmentioned best friend by turning the show into a one-act play. But in our recent episode, we branched out to review a very special comic book story for the first time, specifically the Comics Code-less anti-drug story in Amazing Spider-Man #96-98. Given that a lot of the regular readers of this site read, you know, comic books, and/or are generally fans of Spider-Man, I figured I'd give the episode a special plug here. Plus, Doctor Bitz and I (along with one of our other co-hosts, Full House Reviewed's Ryan Alexander-Tanner) are joined for the episode by the writer of the Chasing Amazing blog, Mark Ginocchio, who also recently wrote the book on Spider-Man, 100 Things Spider-Man Fans Should Know and Do Before They Die. So while you're waiting in line for Spider-Man: Homecoming this weekend, give it a listen, and if you like what you hear, check out some of our other episodes (and if you want to buy Mark's book, too, I won't stop you...). The link below will enable you to listen to and/or download the episode directly, but you can also listen via iTunes, Google Play, Podbean or Stitcher, with links to all four on the show's main website linked to above. One thing about Norman I found interesting is his exceptional background at the time. Back in those days, comic book villainy was caused by some accident (Luthor and the hair loss by Superboy; Doc Ock and the explosion). However, Dr. Doom and Norman already were portrayed as having issues before the accident. 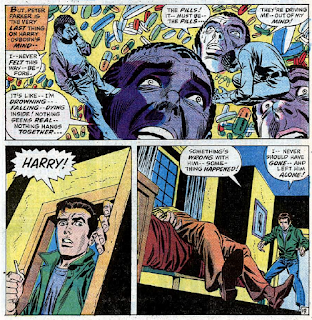 Doom wanted to make the world pay for persecuting his family, while Norman was something of a cold distant father to Harry and a crook who framed his partner for embezzlement. The Goblin formula explosion made a bad man go nuts. I believe there were two or three Goblin stories between the intro issue and the 39-40 Unmasked storyline. One was the 1st part of a 3-parter (introducing the wing glider) that had (I think) Peter do his first 'I quit' storyline. Then there was the crimemaster. Yes, there was that SPECTACULAR magazine between 39-40 and the drug stories. The dinner scene already had Osborn in the know; he intended to expose Peter's ID in front of everyone. Evidently the window got fixed, and it was made big enough for the Goblin to get in and kidnap Gwen with no exterior evidence of an entry (MARVELS#4 shows the Goblin coming out the window with Gwen and Glider). I think the difference about the Goblin seeing Harry Part 2 was that Spidey was forcing him to focus. Despite the skeeviness factor, judging by how the 39-40 and SPECTACULAR portrayed Osborn in wifebeater and shorts after getting stripped, I'm assuming he was wearing those in this issue. Do we judge Peter too much about his hope about the Osborns, considering no one, not even the writers, knew the combination of drug overdose and mental breakdown would lead to #121. 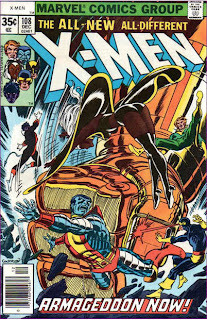 Any chance you will review that Spidey-X-men x-over in SPECTACULAR#197-199? I don't think the Spec Spider-Man issues qualify for AVSE, but if you're asking in terms of X-aminations, I currently have them on the "maybe" list, which means I may slot them in if I need shift things around or give myself a little break, or they may end up as eventual "Retro X-amination", but I'm not currently planning on reviewing them. (I should add, I've never read them, so I'm going off synopsis and whatnot in making my determination that they're not essential to the X-narrative). Well, that was fun. I never do podcasts, so the running length of 111 minutes felt a bit prohibitive at first, but when you guys only got around to dissect the actual issues at 28 minutes mark or so, I started to feel it's probably doable for me. Thigh sapping strength gas, yay! I was utterly blown away by the high production values of the theme song, btw. The drum-beat thingy at the end of a bar(?, yeah I don't know musics) reminds me of Mick Smiley's Magic like PSY reminds of Pump Up The Jam, which immediately wins me over always. I hope Nashville makes one around the Avery Barkley character, so you get to make Avery Special Episode out of it. And glad you liked the theme song! Most episodes, it's easily the best produced part of the show! Should we expect one on HULK #388 sometime in the future? The one where Jim Wilson returns and reveals that he's HIV-positive and where PAD oversees Marvel to actually cross the line from "subtle" to "sledgehammer"? Oh and the follow-up in HULK #420, where the cast drives it home to you that you would be Wrong to subscribe to the sort of foolish misconceptions about AIDS that you might have been previously implied about in places like, oh I don't know, HULK #388 by pink-shirted Jim Wilson, and Tyler and his companion. I hadn't thought of those HULK issues, but I'll definitely add them to our list for potential episode fodder - they definitely fit the bill!